Our bags came in the mail yesterday and everything turned out as we ordered. I'm sure our customers will love the sleek quality of our bags! These bags make the best girt bags! They were a huge hit at out latest expo! When I first went through the ordering process, Custom Earth were very diligent and the final quality of our bags certainly matched the great customer service! Our bags are sturdy on top of being practical. Great bags overall!! Our bags arrived exactly according to our order and we are very pleased with the final result. In particular, our logo is emblazoned prominently across the front and will be sure to attract plenty of potential customers. Excited to see the impact our bags will have! The overall quality of our bags is top-notch, matching the also exceptional customer service we received from Custom Earth. An easy 5 stars! These are made with such a sturdy material! They are able to support heavy contents while looking great! Really happy! So excited! My bags look GREAT! So glad we have an environmentally friendly alternative to distribute to our clients now! Thanks CEP! Love my bags! I'm really gaining maximum business expose with the large surface area for my logo! Awesome bags! Really stylish and offer great visual impact. This bag can easily support four full bottles of wine, I was very skeptical about this because of the weight of (4) full 750 ml bottles is not light weight. But there is no issue I and all my customers have been using this bag for 6 months, I would recommend this reusable wine tote bag. My italian restaurant hosts a wine tasting event every month these bags make a nice gift to all my customers when they purchase bottles of wine form us. We use the gold colored wine tote to package our New Years Eve champagne bottles. 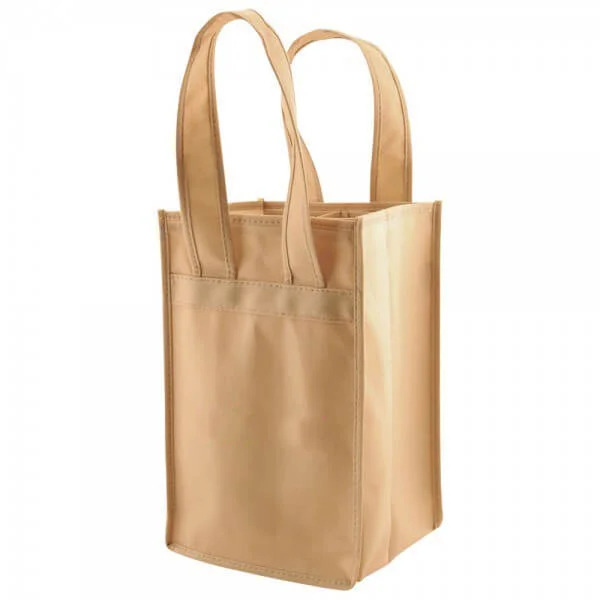 We offer a great sale on a 4-pack of champagne and use this bag. The customers love the sale and love the bag. Very strong bag, the divider is great you don't have to worry about your bottles hitting each other. I would highly recommend this wine tote. We have used custom earth promos for years. They always deliver a quality product. I suggest using these reusable wine totes your customers are guaranteed to be happy like mine are. We worked with custom earth's design team to assist us in the overall graphic design of what we wanted printed on the bag. It was very easy to work with them and the design came out exactly how we envisioned. I look forward to working with them on our next project. 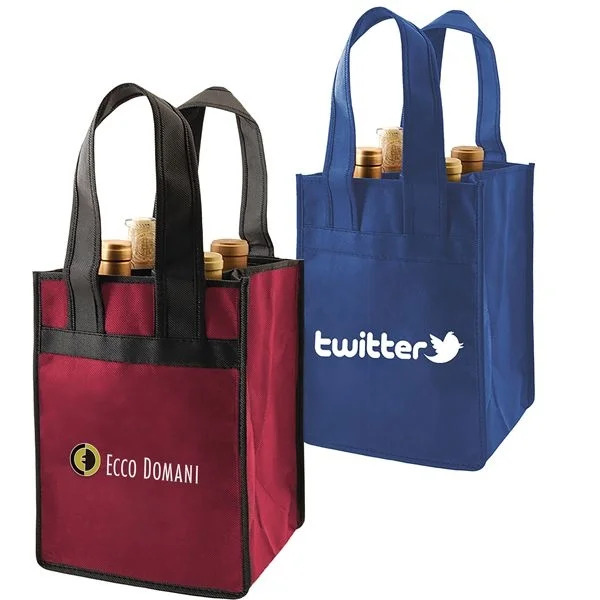 We love this wine tote, great way to promote your company and eco-friendly lifestyle. It was a pleasent experience working with custom earth promos. Our reusable wine totes came out looking the way we wanted, which was we needed the bags printed logo to match the logo on the wine bottle label. It is a perfect match, I wish I could upload a photo. My family has been making wine for generations, we use this wine bag to hand out our holiday bottles to friends and family. The price is very affordable for a large quantity of bags. We ordered all four colors of this wine tote with the same company graphic. The print quality is consistent across the board for all of the colors and the material the bag is made of is a tough durable material. Very good buy, I advise going with this reusable wine bag. High print quality. Our graphic really adhered well to the non-woven polypropylene material. We use the merlot color for our reds, and the natural color for our whites. This is a great wine tote I highly recommend this to any wine/liquor store. We sell this bag and several recycled reusable grocery bags at my fresh foods market. We have banned the use of the plastic bags at my store, and the customers love it. Smart, stylish and convenient. Those are just a few of the glowing descriptions for the Reusable Promotional 4-Bottle Wine Totes Collection from Custom Earth Promos. Completely made from recycled materials, and large enough for just about all uses, at 7" W x 11" H x 7" D, these wine bags give you a huge imprint space to give your brand the maximum exposure and visual impact. In effect, your customers become permanent mobile billboards that are promoting your business—and the eco-conscious message—every time they carry your bags in public. Reusable Promotional 4-Bottle Wine Totes from Custom Earth Promos continue to gain popularity as the promotional product of choice for businesses in the hospitality, restaurant and catering industries, to name just a few. Ideal as gift bags for trade shows, promotional events, store openings and all kinds of other special occasions, the oversize wine tote implants your name into the minds of anyone who happens to even just glance at this eye-catching bag. So you’re essentially getting free advertising that can reach a potentially unlimited audience and area for the entire time that this exceptionally durable bag is being used—which could be years. And you get all of this brand exposure to a vast audience at very little cost. People really just love to get their hands on these practical recycled bags. So the sooner your custom logo is imprinted on one, the sooner your brand name will be out there being burned into the brains of thousands of potential customers. Available in four classic colors—Black, Burgundy, Merlot, and Natural—our Reusable Promotional 4-Bottle Wine Totes are highly popular with businesses like liquor stores, restaurants, bars and hotels. In today’s increasingly eco-conscious atmosphere, more and more people are simply refusing to be “that person” in the grocery store checkout line who still grabs a handful of destructive, toxic plastic bags to carry their shopping home. will go out of their way to grab these long-lasting, reusable totes. So when you distribute our environmentally friendly alternative to plastic bags, you’ll be playing a large part in saving the earth yourself. Custom Earth Promos makes it affordable to benefit from the powerful brand reinforcement and promotional advantages you’ll get from our high-quality customized wine bags. These attractive totes will prominently feature your brand logo or custom message on a large space for an essentially unlimited audience. Rely on our talented team of design experts to help you reimagine the design and message for your custom imprint—and then bring it to life! Plus all of our products are free of harmful pollutants and chemicals, in compliance with California's Proposition 65 regulations. So you can be absolutely sure you're providing your customers with top-quality, environmentally safe products they’ll be happy to use every day. At Custom Earth Promos, we go the extra mile and leave no detail unexamined as we build your wholesale order of Reusable Promotional 4-Bottle Wine Totes from scratch. From choosing a fabric color that perfectly matches your brand logo, to finalizing your custom trimming and accenting, our overseas production team gives you high-quality work for a truly affordable price. Plus you get to choose from a wide range of additional custom options, whether you want to add insulation, increase material density, attach additional pockets or adjust the default dimensions, we do it all. Just give us 8 to 12 weeks, and you can expect fully customized, professional-quality, wine totes to help take your marketing campaign to the next level.